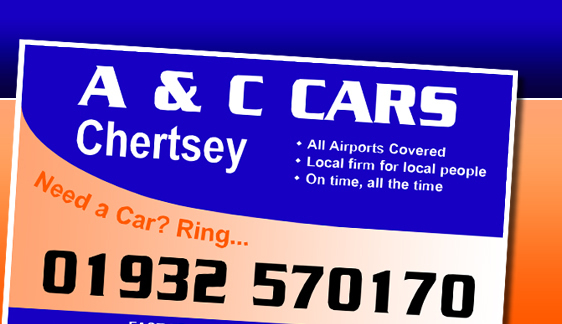 A & C Cars based in Chertsey, Surrey are dedicated to provide a professional, reliable and friendly taxi service for the individual and corporate client. Reliability and punctuality is essential to provide clients with a quality service that is expected. We have cars of all varieties such as estate cars and 8 seater mini buses. A warm welcome awaits you from our operators. Fully licensed operator with Runnymede Borough Council. Experienced and courteous drivers, all vehicles registered and metered. Airport specialists with a Meet & Greet service available, arrival and departure times monitored. An affordable and reliable taxi service. 06:30hr until 00:00hr – Monday to Thursday. 06:30hr until 02:00hr – Friday and Saturday. Pre-bookings can be made should your requirements fall out of office hours.